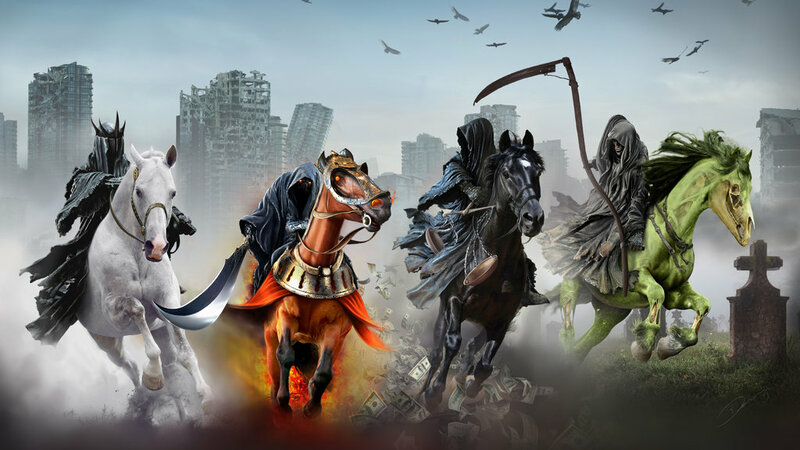 We are watching the Four Horsemen of the Apocalypse attempt to destroy the United States and everything it stands for. Never in American history has such a cabal of cultural and political players banded together with the specific purpose of undermining not only the serving president of the United States but the very fabric of the country itself. The idea of American Exceptionalism has been with this country since its founding. The American Constitution was the first constitution in history where the government was granted limited power and was explicitly barred from infringing on specific rights of citizens and the governed. From the beginning the premise and reality of limited government and individual rights such as free speech, exercise of religion and private property created a virtual – albeit imperfect – Eden of creativity and experimentation that changed the face of the world. Whether it was Cyrus McCormick inventing the mechanical reaper, JD Rockefeller driving the petroleum industry, Bill Gates putting a computer on every desk or Steve Jobs essentially creating the mobile revolution, the United States has done more to bring prosperity to the world than any nation in human history. And it’s not even close. Add such government led endeavors such as winning World Wars I & II and the Cold War, putting a man on the moon, inventing the Internet and mapping the human genome and it’s clear that the United States is the most consequential nation that has ever existed on the planet Earth. None of this suggests the United States is or has been perfect. It’s not today and it never was… but as Winston Churchill once noted “…it has been said that democracy is the worst form of Government except for all those other forms that have been tried from time to time.” We’re of course not a democracy, but in this case his words apply to our republic. Any objective analysis of human history will clearly demonstrate that, while no doubt standing on the shoulders of giants, the United States has led a march that has done more good for more people than any nation in history. From more prosperity, more freedom and more opportunity to less poverty, less war and and more democracy, life on earth today is spectacularly better for a higher percentage of the world's population than has ever been, and much - but not all - of that was driven by the United States, both as a nation as as a result of the efforts of individual Americans or those working together in one corporate form or another. But in 2018 none of that is relevant. What is relevant is that America (i.e. conservatives or Republicans) is racist. America is sexist. America is homophobic. America hates Muslims. America as a nation is none of those things. On the contrary. Minorities of every sort have more opportunity to succeed in the United States than in any nation on earth. As an example, the average income for black American households in 2016 was approximately $38,500 in 2106. That is over 7 times the $5,300 of Botswana, the highest average HH income on the continent of Africa. At the same time it’s almost 60% higher than the Bahamas’$24,603 the highest HH income of any majority black country in the world. Similarly, gays in the United States are largely able to live their lives as they choose without fear of being jailed, thrown off buildings or executed as they might be in many countries. Women attend college at higher rates than men and half of the Fortune 500 was founded by immigrants or their children. None of this means that there is no hate in the United States or that minorities do not encounter challenges. There is hate, but there is hate everywhere on every continent and in every nation where humans live. There always has been and always will be, at least until we’re replaced by machines without hearts and brains. But that fact does nothing to alter the reality that the United States offers more people more freedom and more opportunity for success than any place on the planet ever has. And that is fundamentally because of our Constitution based limited government, our free markets and, frankly, the American spirit that drove the country to simultaneously take on and defeat the Nazis and the Japanese at a time in history where it looked as if they would take over the world. All of that is imperiled today by the Four Horsemen of the Apocalypse who are together seeking to destroy everything that made America great in the first place. 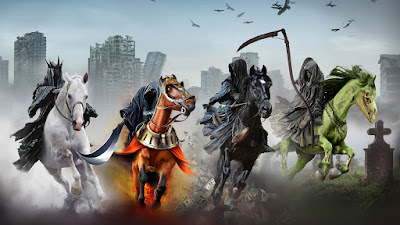 These Horsemen are: 1) Hollywood and the Mainstream Media 2) Social Media 3) Unions and the Education Industrial Complex 4) The very real Deep State.